Morgan Ortagus recently reached a position many aspire to all through their career as a government official. She was recently appointed by President Donald Trump as the Spokesperson for the United States Department of State. The position is one of the many positions in the United States government that carries a lot of prestige. The appointment which began on the 4th of April 2019 is the culmination of a career that has seen her work in the United States Treasury Department and USAID. As a spokesperson, her media experience comes from working as a national security contributor for one of America’s leading news networks, Fox News. There is a lot to learn about the life and career of the newest addition to the Trump Administration. Morgan Ortagus was born Morgan Deann Ortagus on the 10th of July, 1982 in Auburndale, Florida. She is the only child born to parents Ronald E. Ortagus and Denise C. Ortagus. She grew up in a family of entrepreneurs as her father was the owner of a cleanup and restoration company while her mother worked as office manager. There is no information regarding her high school years but as a pretty teenager, Morgan Ortagus competed in several beauty pageants, like Miss Florida Citrus Pageant, Miss Orange Blossom, Miss Auburndale, and Miss Teen Auburndale. Her biggest win during her beauty pageant career was in the Miss Florida Citrus pageant in 2002 at the age of 20. Following the completion of high school, Morgan Ortagus proceeded to college at Florida Southern College where she earned a Bachelor of Science degree in Political Science in 2005. Not one to be satisfied with a single degree, she earned a double masters from Johns Hopkins University, earning both Master degrees in Business Administration and Government respectively. Morgan Ortagus career began in 2006 when she became the press secretary for the campaign of K.T McFarland’s Senate campaign. Although she had previously worked on another campaign, it was her first major role in a recognizable position. She joined the United States Agency for International Development in 2007 and worked there till 2008 as a public affairs officer. During a year service in the role, she spent a lot of time in Baghdad, Iraq. After USAID, Morgan joined the U.S Treasury Department, working as an Intelligence analyst. Her work as an intelligence analyst focused on North Africa and Middle East regions. After two years in the role, she was deployed as a Deputy Treasury Attaché to the US Embassy in Riyadh, Saudi Arabia. After serving in Saudi Arabia, Morgan returned to the United States and left public service to join the private sector, working for Standard Chartered Bank as the global relationship manager. She then joined Ernst & Young in 2016 and helped establish the company’s Geostrategic Business Group. Before she was appointed to the position of Spokesperson for the U.S State Department, she also worked as a national security contributor for Fox News and was a member of the United States Navy, serving as a U.S Navy Reserve. She also co-founded a geopolitical and policy advisory firm, GO Advisors. Morgan Ortagus has so far been married twice. Her first marriage was to Joshua Dobbs. A United States Marine officer whom she met while she was in Polk County, Florida. Very little is known about the relationship, when exactly they got married, and what led to their divorce; however, we do know that the marriage ended and the couple had no children. 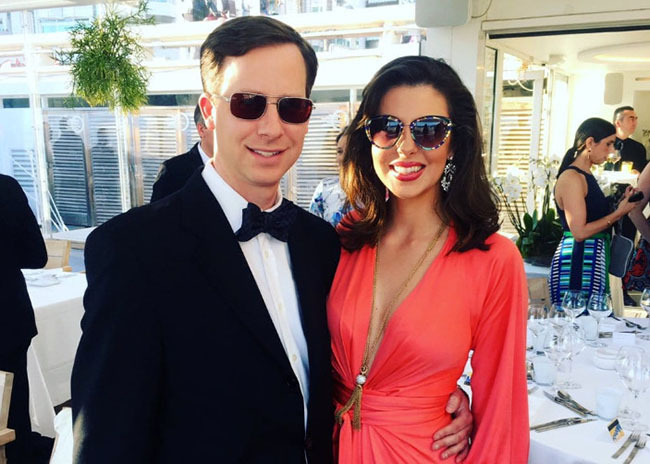 Morgan Ortagus was single for a while before she met Jonathan Ross Weinberger. Not many people can say their marriage was conducted by one of the most celebrated judges in American history, but Morgan and Jonathan had the pleasure on the 11th of May 2013 when their marriage in a courthouse was conducted by Ruth Bader Ginsburg, a Supreme Court judge. After the court proceedings were complete, the couple held a ceremony in Jewish tradition in celebration of their marriage. The couple so far does not have any children. Her husband, Jonathan Weinberger has had his own stint working for the US Government. He has served as a White House associate general and executive secretary on Trade. He has also worked as the secretary at the U.S Treasury Department. Currently, he serves as the Executive Vice President of the software company, Veedims, LLC. As a former beauty queen and a former television personality, Morgan Ortagus has great looks. They reside in a body that is 5 feet 7 inches tall with a weight of 59kg. Her slim fit body is further complemented by notable features like brown hair and green eyes. Her bust, waist, and hips, which are her body measurement stand at 37-25-37 inches respectively. 1. Morgan Ortagus is a member of the New American Security Council and Future of Sanctions Task Force. 2. Before her appointment in 2019, she was a known critic of President Donald Trump, especially in 2016 when she notably called him, disgusting.